The $482 million PPS School Building Improvement Bond, approved by voters in 2012, is well underway with seismic, roof, accessibility and science classroom upgrades already completed at a number of schools. The rebuilding of Franklin and Roosevelt high schools and Faubion PreK-8 is underway and will be completed by the fall of 2017. The Bond work will also fix leaking and deteriorating roofs and make seismic safety, accessibility and science classroom improvements at up to 63 other schools. As of the start of 2016 total of 45 schools have now received Bond work and these projects employ hundreds of workers from local companies. The bond program is the largest and furthest reaching that PPS has ever undertaken and is one of only two school bond programs of comparable size in state history. As this multi-faceted work unfolds, PPS wants the community to be informed and to have a resource for understanding some of the complexities of the bond program that is reshaping our schools for 21st century learning. This Frequently Asked Questions document will be regularly updated. Submit questions to schoolmodernization@pps.net. We will respond to your email and will select larger/key questions for inclusion in this FAQ . Click here for the PDF version of this FAQ. Q: What are the bond program's Guiding themes? Provide a clear protocol for citizen oversight of bond projects: Built into the PPS School Building Improvement Bond is the Bond Accountability Committee, an independent panel of citizens with expertise in the fields of design, construction and capital project accounting who meet regularly and are charged with reporting quarterly to the school board on how well PPS is delivering on the voter-approved bond projects. Members of the public may observe the BAC meetings. To maintain the integrity of the oversight process, no other citizen group receives regular briefings from PPS staff or is asked to regularly report to the school board. Provide a clear protocol for independent, professional oversight of bond projects. Built into the PPS School Building Improvement Bond are annual, independent financial and performance audits that are presented to the Bond Accountability Committee and school board. 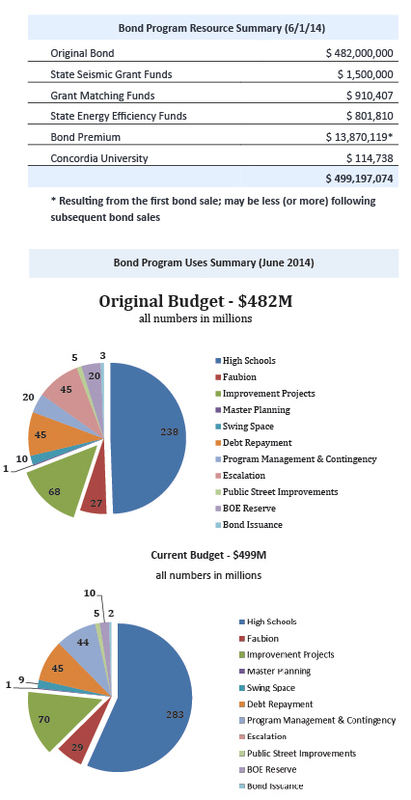 View the June 2014 Bond Performance Auditor Report. Balance pre-planning with flexibility and responsiveness: PPS engaged a dynamic, hard-working citizen-led committee to assist staff in updating the PPS Long Range Facilities Plan (2012) that became the framework for our bond program. A Bond Development Committee, with some of the same members, recommended which schools would get what types of upgrades and why. Following additional community input, the school board approved the Long Range Facility Plan and wrote a bond ballot measure to support the recommended projects. The bond measure includes a budget with contingency and reserve funds to handle shifts in costs that are expected with a program of this size. The budget also provides some flexibility, not only for cost increases but also to be able to respond to what – within reason - our community wants in its schools. Community aspirations cannot be fully articulated ahead of time. For example, there is greater focus on career learning in our comprehensive high schools now than when the bond measure passed. Because of financial discretion written into the bond, PPS has been able to respond with updated high school designs. Balance community input with the need to get the rebuilding work done: The PPS bond program has included deep and diverse community engagement from the start. This has included the citizen-led committees that worked with PPS staff to update the Long-Range Facility Plan and helped develop criteria that PPS used to choose which schools to upgrade first and why. In addition, the community, partners and staff at each of the three high schools and one PK-8 school that are being rebuilt have extensive opportunities to help shape the design of their new school. When the school board approves the schematic design for each project, community involvement narrows. This is when the architects, contractors and project managers get down to building the school the community has helped design. Value consistency and equity while meeting the needs of individual schools and students: Portland Public Schools is a system of schools that strives for a shared level of quality, rigor and offerings for students. Applying that value to the bond, the bond process identified a set of upgrades, such as seismic strengthening and more accessible buildings, that every school should have and set about doing that work first at the schools most in need. However, PPS also strives to identify and respond to the needs of individual students as a proven strategy to raise achievement and close the educational opportunity gap. So, for example, the schools that are being rebuilt will have some variation based on the needs of students at that school and that school community’s vision, interests and partnerships. Both Roosevelt and Franklin high schools will have significant career learning spaces, for example, but a special focus at Franklin is health sciences and a special focus at Roosevelt is writing and publishing. At the same time, the spaces in rebuilt buildings must be adaptable over time to adjust to changes in student and teacher needs, career pathways, staff expertise and partnership opportunities. Q: What is the budget for the whole bond program? In some cases, additional funds like the state grant made it possible to take on an additional project, such as the full seismic retrofit completed at Alameda Elementary School in summer 2013. In other cases, changes made to a project required a budget adjustment. See the Franklin High School example in the high school budgets question below. PPS staff reports to the school board about the status of each project and its budget monthly. The Bond Accountability Committee reports to the board quarterly and financial and performance auditors report annually. Q: Why did PPS decide to build comprehensive high schools for higher enrollment than originally planned? In November 2013, the school board decided to use bond reserves to increase the size of the high schools to reflect updated enrollment projections and expected growth in the Portland area. The bond will now design each high school to serve 1,700 students. PPS based the original capital bond program on the Long Range Facilities Plan, approved in spring 2012. That plan, based on projections at the time, called for high schools that could each serve 1,500 students. Q: Why and how have the budgets for rebuilding the high schools increased? An increase in projected enrollment, requiring larger buildings. The desire to make more classes per day available to students, requiring more classrooms. The recent ability to hire more teachers and reduce class size, also requiring more classrooms. The opportunity for educators, students and community members to more specifically define their needs than was possible when the bond was in the proposal phase as a ballot measure. At this time, the school board is considering ways to add more classrooms to Franklin, Grant and Roosevelt which, if approved, will further increase project costs. Q: Is the budget allocation for the three high school projects equitable? Yes. PPS is using two documents to guide design and hence budget parity in the modernized schools. Using these documents for guidance, staff and the school board have taken considerable care to equitably apply to all of the high schools any refinements that have been made during the design process to the size, configuration and budget for each school. The Long Range Facilities Plan, the basis of the 2012 bond, envisioned modernized high schools with a common set of features, such as a mix of classroom, hands-on and career learning spaces and such public spaces as a theater and a student commons. The Education Specifications created a framework for how the PPS academic program is translated into classrooms and common spaces. At the same time, parity does not mean identical. As referenced in the guiding themes at the beginning of this document, PPS seeks a balance between equitable learning spaces and buildings designed to meet the individual needs and interests of students in specific school communities. Q: How is PPS deciding how large to build the high schools? Projected enrollment and the square footage needed to fit that number of students. Desired class size, which helps determine how many teachers and how many classrooms are needed. How many of the rooms are expected to be in use at any given time. PPS is planning for 100 percent utilization of classrooms. How many and what size of support spaces (labs, library, cafeteria, meeting space, offices, etc.) are needed to support the projected enrollment. Each school’s master schedule that, for example, sets how many sections of the Freshman Humanities class will be offered in a teaching day and at what times. Some of these factors, such as the desired number of classes each student should be able to take or the desired class size, are defined at a district level and are largely consistent across schools. Other factors such as the school’s master schedule, vary by school based on the needs and interests of each student body, and can result in different demands for classroom type and number. For example: Currently, Roosevelt students enrolled in Algebra take one period of Algebra and one period of Algebra support, while Franklin students enrolled in Algebra do not take the additional support period. As a result, Roosevelt needs more general education classrooms to accommodate more students in longer core curriculum classes. As needs change over time, classrooms will be used in different ways. Extensive discussion with PPS educators and school communities about the use of space in our high schools led the Portland School Board in May 2014 to explore adding more classrooms and related support spaces. The discussion is driven by the desire to increase the number of credits students can earn over their high school career, lower the teacher to student ratio, and link related classroom usage and teacher planning periods where feasible. Decisions that come out of this discussion will further influence high school designs. Q: What has PPS done to manage costs while balancing the longevity and functionality of the buildings? Manage costs and longevity: Selection of cost-effective yet durable materials in such key areas as flooring, roofing, plumbing, etc. Functionality: A balance of standardized teaching and learning spaces (for example, classrooms of a certain size) with a variety of other learning spaces, such as extended classroom space and commons areas, all with an eye toward flexible use over time. Sustainability: The building industry uses a widely recognized ranking system to measure the sustainability of a building over time. PPS is using a minimum standard of LEED silver for the buildings, such as the high schools, that are being modernized and a minimum standard of LEED gold for buildings, such as Faubion PK-8, that will be replaced with new construction. Q: Why are PPS and the City collaborating on student transportation projects at bond schools? Many public and private improvement projects include requirements to construct related transportation improvements as a part of the work. PPS and the City have agreed the City will design and construct any required transportation projects in the City’s right-of-way. PPS provided $5 million in bond funds to the Portland Bureau of Transportation (PBOT) as the total cost of PPS’ commitment for these projects. Our agreement prioritizes student transportation safety projects required as conditions of permit approvals associated with schools receiving full modernization (Franklin, Grant and Roosevelt High Schools) or replacement (Faubion PreK-8). Other summer improvement project school sites may also be included, as funds allow, to receive transportation improvements that support safe walking and biking to school. Q: How can I remain involved in the bond projects as they unfold? A citizen Bond Accountability Committee (BAC), chartered to review bond projects and offer advice directly to the school board, meets quarterly. Citizens may attend and observe these public meetings. When the schematic design for a bond project is approved by the school board, public involvement narrows so that the work of finalizing architectural drawings and preparing for construction can be done. PPS staff gives monthly written and quarterly oral reports to the Portland School Board on bond project progress. The board meeting schedule and agendas are shared with the public and available on the school board website. The meetings include time for public comment. PPS also makes presentations to neighborhood, business and parent groups as staff capacity allows. The PPS bond website is continuously updated with project details, public workshops and open houses and other ways to stay informed. If you have questions: schoolmodernization@pps.net or 503-916-2222.